It's really worth spending some time to know it. 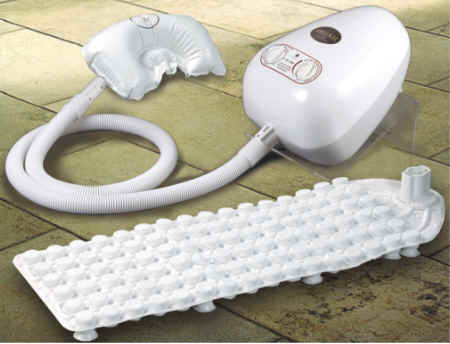 This home spa product consists of a device that fuses PU with ceramic fibers to generate far infra red radiation. It can improve the quality of bath water, soften tap water, improve water to skin adhesion and promote blood circulation. Arising from a high frequency medium with no tonic by products, it is relatively expensive but it kills germs 3000 times more effectively than chlorine, is noiseless and reaches German standards of 0.05 ppm. Millions of bubbles are generated every minute by this home spa product. Continuous collision generates ultrasound with a frequency of 8-10 kHz of high frequency energy. This translates into 1.5kg massage pressure capable of simultaneous and continuous massage for all 320 acupuncture points in the body. As tested by J.P. Industry University, the absorption of ultrasonic is 13% in bone, 3.3% in muscle and 0.0022% in water. Our body is comprised of 66% water, therefore can be penetrated and warmed up rapidly. Just like boiling egg in a hot spring, the yolk cooks faster than the egg white. With 38°C ultrasonic bath, the heat of ultrasonic reach the bone in approx.10 minutes and expand outwardly where else bathing in water temperature of 42°C will take 90 minutes to reach the bone. (Long hour in high temperature may be harmful). Immersion in ultrasonic bath quickly heats up the body from within, increasing metabolic rate like a bath in a natural hot spring. Can help blood vessel expansion, enhance blood circulation, hematopoiesis and resistance against diseases. This form of hydrotherapy promotes the normal secretion of hormones, strengthens the function of reproductive organs and improves the quality of family life. Hundred thousands of small energy bubbles press and stimulate the whole body every second massaging 320 acupoints across the body. Relieves tension and fatigue, relaxes and balances, massages the backbone and encourages the production of red blood cell, white blood cells, etc. = to hydro acupuncture. Internal organs are stimulated, blood and lymph circulation are facilitated and muscles are relaxed. Giving a full body massage, this treatment burns fat, eliminates flabby tissue, improves the bust line, shapes the body and fills the user with confidence. Powerful bubbles from this home spa product clean 1.5 million capillaries in the skin, bringing intense nourishment. Allows skin tissues to breathe better. Body generates 0.05 sq m of dirt every day. SG-2000 takes about 5 min to loosen grease and 1 week of continuous use will complete the whole cleansing process. Ultrasonic bath produce 10,000~15,000 micro-tremors per second (1.5kg/cm2 on the skin), has the effect of a complete body workout. Experts believe that the effect of 15 minutes of ultrasonic bath is equivalent to 3 to 5 km run. Provides effective passive exercise. It doubles up as a spa a lazy man’s exercise machine. This home spa product can remove dead skin cells and ozone kills germs and whitens skin. Every min. a million bubbles provide beauty treatment of slimming professional standard for every inch of your skin. After using for 15 min. 300-400 calories were burnt – an effortless way to have fairer complexion and slimmer body. Grand Sun Enterpricse SH Co. ChongTai Intertrade Co., ltd.